New Boy - Or Othello in the Playground. - Liz Loves Books.Com. New Boy - Or Othello in the Playground. This is part of the Hogarth Shakespeare series where different authors take on retellings of Shakespeare, presumably to make it more accessible. 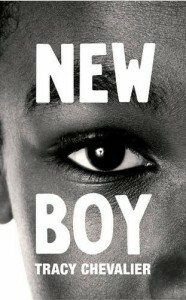 In "New Boy" it is Othello that is under the spotlight - Tracy Chevalier moves the action to a school playground and sets it over a single day - the narrative of the play transitions really well to this environment, closed and clique - New Boy "O" arrives at an all white school and meets "Dee" - friendships form, relationships develop then one jealous and destructive lad shatters everything. I enjoyed this - the author brings a sense of atmosphere, a special kind of tension to the storytelling, if you know the play you'll know things are not going to end well, if you don't then you'll find it utterly gripping. This is not a straightforward plot redevelop, nuances are added to fit in with the setting, the language used is cleverly insightful, casual racism, playground politics all used to great effect. The claustrophobic school setting makes this work - this is the first of these I have read but if the other authors tackle it as well I'd like to read the others. As a Shakespeare fan I loved seeing this pan out, it was intriguing, emotive and really rather good.